Does anyone remember this song from the 80s? It is one of my favourites so when I found out there is a nail polish with the same name by Catrice, I just had to get my hands on it. I was so very excited to try it, that I didn't do anything else to it. And oh boy, was I disappointed! You see, it's a classic case of nail polish that looks fantastic in the bottle but not so much on the nails. In the bottle it's a lovely black full of pink and teal glitter. 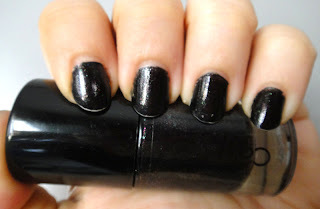 On the nail, as you can see, it looks plain black, even under the brightest light. 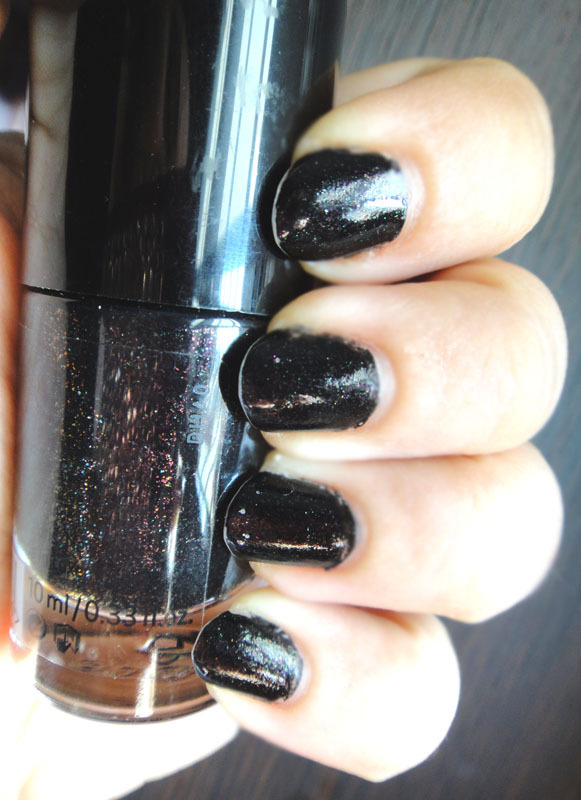 The application and formula were perfect in two coats (plus Seche). I only wish the glitter would show up. Also this colour reminds me of a Japanese nail polish I have which is almost exactly the same. I need to dig it out and do a comparison. I do apologise for the tipwear. As I was quite disappointed I took these photos 4 days after applying this polish, that's why my nails look like this. 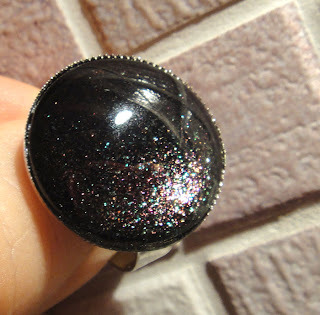 Wanting to give "I wear my Sunglasses at night" one more chance, I decided to try making a nail polish ring. And yes, it is much better. You can see all the pretty glitter perfectly. This is a nightime photo that I just took but I will update this post with daytime photos asap, so you can see the colour in its full glory. And I will close this post with my favourite version of the song that shares a name with this polish! Very cute mani and I love the matching ring! I love that song!! What a bummer that it doesn't look like it does in the bottle I hate when that happens the bottle color can be so misleading sometimes, that ring is adorable! Ohhh! Can you do a tutorial of how to make a nail polish ring? I want to know how! Hmm, this does seem similar to a couple in my collection too. Sorry it disappointed on the nail but thanks for the report! oh the ring is lovely! Είναι τέλειο και το χρώμα υπέροχο, αλλά με το δαχτυλίδι ενθουσιάστηκα!! Oh gosh, look at how much more the glitter comes through in the ring!!! Great shade! Any layering possibilities that can make this appear like that on your nails too maybe? Hi Cel... Your nails looks so fabulous on that polished..